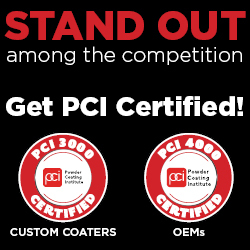 PCI is your connection to the powder industry. Locate job shop or custom coaters using the form below. You can filter by Location (enter in complete state name), company name or by the custom coater capabilities. You can also just hit continue without entering any filters to see a complete list of our custom coater members. You can also check out our Powder Coated Tough Buyers Guide for more information. Search our list of custom coaters by the type of coating you are looking to have applied. Search PCI's Custom Coater member database for companies that have the following cleaning capabilities for your part. Many of PCI's Custom Coater members offer additional capabilities to support your finishing project.